I know, Halloween is still 23 days away, but today we threw a crafty Halloween party! 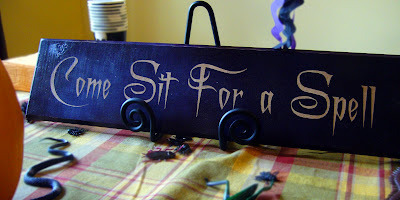 It was partly in honor of my five-year-old's birthday, and also to give you some ideas for your own spooky get-together. I think it was a hit. The birthday boy proclaimed it "the best Halloween birthday party EVER!" The party started with some sweet snacks that the kids got to help with. However, you'll have to wait until tomorrow's post to see what they were (and how to make them!). The favors for the kids were the usual junky Halloween items, found mostly in the Dollar Spot at Target. Exciting for them, but not so much for you. So we thought we'd share the favors we made for the more mature attendees. This hand-stamped candy bouquet was made at last month's stamp camp with our Stampin' Up! demonstrator, Anne Beale Yancey. We stamped the spooky creatures and mounted them on scalloped circles, then adhered them to both sides of York Peppermint Patties. Then we speared them with shish kabob skewers and stuck them in a cup of Halloween M&Ms. The cup's collar was cut with Stampin' Up! 's new Hot Shot die cutting machine (which AB is offering a spectacular deal on this month). This cup makes me happy! Check out this darling vinyl spider and "spooky" label Stampin' Up! is offering this month. I totally want to make this, but I'll have to use an opaque cookie jar. If my kids can see the candy, it's all over. In our opinion, a party isn't a party without a craft project. The kids had a blast making these glow-in-the-dark pet monster rocks. And they were so cheap to make! First, they painted them with glow-in-the-dark acrylic paint. Apply it liberally so they will really glow! Then they drew creepy faces with paint pens (watch out, these are very permanent!). The adults helped by gluing the googly eyes in place. Our game was "pin-the-face-on-the-jack-o-lantern." Each kid had a chance, after being blindfolded and spun three times, to stick a piece of the jack-0-lantern's face on a pumpkin. They thought it was hilarious to see how it turned out! We've got more ghoulish tricks up our sleeves, so come back this week and get inspired to host your own Halloween party! I like the pin-the-face game. THat will be wonderful for my daughter's preschool party. Excited to see how to do the treats tomorrow. What a fun mom you are! Those rocks are so scary!!! Your SU demonstrator has really cute projects! just found your blog from momdot and i love it! What great Halloween activities. I love the pin on the pumpkin game! Oh my gosh, I actually have glow in the dark acrylic paint! Never used it. Not even sure why I have it :) But we are SO doing those rocks. What a great keepsake.